With $50,000 and other prizes up for grabs with a hole in one, this year's Midwest golf tournament promises to be an another exciting golf event for MTI. When you pull inside the gates of Geneva National Resort in historic Lake Geneva, Wisconsin, you feel yourself begin to relax and unwind. As you drive through the beautifully manicured streets of this thriving 1600-acre community, nature invites you at every glance. Impeccable fairways, beautiful vistas, scenic views of Lake Como, wildlife at every turn, and a community that blends seamlessly with the natural landscape. 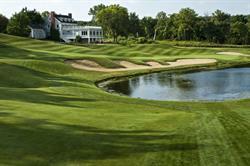 This is the beginning of your experience at Geneva National and the MTI Midwest Golf Tournament and Dinner. Members will play a 4-person scramble that will include teams being drawn by handicaps during lunch in real time. Once teams are set, each team will tee off for a competitive round of golf. Each team will use a combinations of mulligans, throws and 30" strings to enhance their teamwork and score. Once the tournament has concluded members will enjoy a networking reception and dinner. Don’t miss this great event as we return to Geneva National Golf Club. During dinner, MTI will also share updates on major industry projects and benefit enhancements to MTI programs. A lot is happening in manufacturing. Don't miss this opportunity to network with other business owners and executives in the heat treating industry. If you have any questions, don't hesitate to contact the MTI Offices at 904-249-0448 x102 or amanda@heattreat.net.